When compared to the 1960 original, The Magnificent Seven thrills only sporadically, says Dhruv Munjal. IMAGE: At 61, Denzel Washington said he jumped to play a cowboy when his Training Day director Antoine Fuqua offered him the part. So, here's the thing. Sometimes, the more you try to remake something, the worse it gets. To say that The Magnificent Seven is a middling movie would be a grave injustice. The real cataclysm, though, would truly unravel when you start comparing it with the 1960 original and Akira Kurosawa's monumental Seven Samurai (1954), the Japanese classic from which the former is inspired. In the 2016 version -- set in 1879 -- the lives of the earnest farmers of Rose Creek are ravaged by industrialist Bart Bogue (Peter Sarsgaard) and his men, who want to drive the villagers out and inherit all that they've so steadfastly sown. After losing her husband in the defence of the village, Emma Cullen (Haley Bennett) seeks the services of seven outlaws, led by the imperturbable, gun-slinging Sam Chisolm (Denzel Washington). In his choice of cast, director Antoine Fuqua (Training Day and Shooter) has tried to reflect the full multiculturalism of the Old West. Accompanying Chisolm (Chisolm like President Lincoln, he keeps reiterating) is the delightfully abrasive Josh Faraday (Chris Pratt), the knife-wielding Billy Rocks (Byung-hun Lee) and the aphorism-babbling Goodnight Robicheaux (Ethan Hawke), a Civil War veteran who suffers from post-traumatic stress disorder. To complete the ethnic fusion, the film also features a Mexican called Vasquez (Manuel Garcia-Rulfo), huntsman Vincent D’Onofrio (Jack Horne) and Red Harvest (Martin Sensmeier), a Comanche warrior so spectacular with the bow and arrow that he could've so easily found a place on the South Korean Olympic archery team. The film mainly revolves around two fight scenes; the first, which Chisolm describes as "just an opening skirmish”, and the second, a cathartic climax that leaves scores of people dead, including four of the outlaws earmarked to take on the enemy. Where The Magnificent Seven works is in its beautiful simplicity. Nic Pizzolatto and Richard Wenk's screenplay is largely uncluttered, and the fight sequences -- despite the gory pretense -- are 'clean'. Fuqua must be complimented for keeping the digital effects to a bare minimum and effectively pumping up the furor question as the film paces along. Just to keep things real, he even manages to make Sensmeier's character run out of arrows in the middle of the last fight scene. 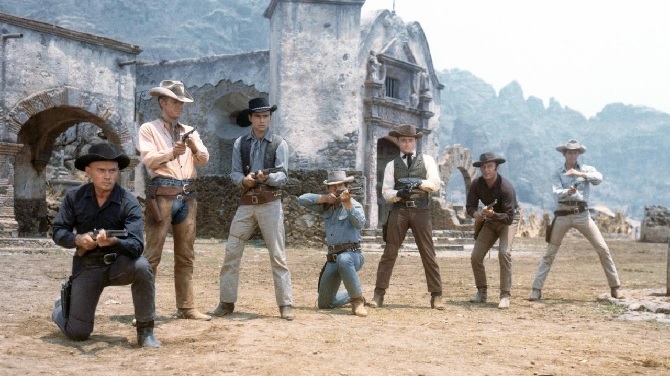 IMAGE: John Sturges' 1960 film The Magnificent Seven had Yul Brynner, Steve McQueen, Charles Bronson and Robert Mitchum among the cast with Eli Wallach as their evil adversary. Akira Kurosawa, whose Seven Samurai inspired the film, contributed to the screenplay, but is not credited. Among the many films Seven Samurai and The Magnificent Seven have inspired are Sholay and Star Wars. Pratt, in his role of an explosive-loving gambler, is easily the most watchable. The occasional buffoonery and caustic humour that he brings to Faraday's character livens up a film that mainly follows a linear path with scant room for delicious subplots. Washington's performance is surprisingly underwhelming. His hard taskmaster, don't-mess- with-me persona just adds to the triteness of his character. Some of his initial killing sprees bear a marked resemblance to Christoph Waltz's character in Django Unchained. The character sketches, however, are mostly well thought out -- in addition to Pratt, Hawke's role, in which he abandons his fellows a night before the decisive battle only to return later, is fairly compelling to watch. What The Magnificent Seven lacks -- that too, strikingly -- is attention to detail. Fuqua's attempt at getting the Southern and Cajun accents right for some of his characters succeeds only partially. The concluding fight scene is shot shoddily, with Fuqua leaving no way for anyone -- characters as well as the audience -- to distinguish between the locals and the enemy. Moreover, James Horner's background score is sure to leave you by the time you exit the theatre. 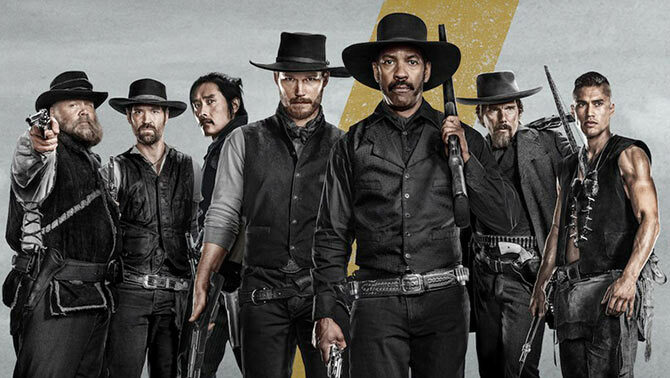 If you unburden The Magnificent Seven from the predecessor that played a role in its making, you get an unfussed Western action film packed with technical correctness. But for those familiar with the original, the film -- made with keeping greater Western sensibilities in mind -- doesn't offer anything new. Here, Fuqua has tried to whip up a Sergio Leone meets Quentin Tarantino, but minus the finesse. The outcome is a film that sizzles only infrequently -- when it could've instead been a brilliant success.